Quite often it is desirable to have a means of connecting two fibers together through a temporary mating device or connector. Figure 7.4 shows a common way to implement such a connector. Each fiber is placed in a ferrule whose function is to provide the mechanical support for the fiber and hold it in place tightly. The ferrule can be made out of plastic, metal, or ceramic materials. The central piece of the connector itself is an alignment sleeve. The two ferrules are inserted in the sleeve, and proper alignment between the cores is ensured because of the tight mechanical tolerances of the ferrules and the sleeve. The gap between the two fibers can be controlled by a mechanical stop which determines the exact stopping positions of the fibers. In some variations, the alignment sleeve is tapered to improve connector mating and demating. Well-designed connectors provide low coupling loss, in the order of 0.1 dB or less. However, as shown in Fig. 7.5, a number of underirable situations can reduce the coupling efficiency. Figure 7.5a shows a case of two fibers with different core diameters. In general, whenver the numberical apertures of two fibers are different, the potential for power loss exists. In this case, light coupling from a narrower fiber core to a wide fiber core is easier and more efficient compared to coupling in the other direction. Figure 7.5b shows an example of poor concentricity. Fibers that do not provide a tigh concentricity tolerance may show large coupling variations depending on the orientation or from one pair of fibers to the next. A large air gap, shown in Fig 7.5c, is another reason for loss of power. An air gap can result from incomplete insertion of the fiber or from mechanical problems inside the sleeve. It is also common for microscopic dust particles to get into fiber optic connector, preventing them from making proper conatact, or even scratching and damaging the fiber facets. More dramatic power reduction results when dust particles land on the fiber core, blocking the light path. As a result, constant monitoring and cleaning of fiber facets are important to prevent such probems. Angular or lateral displacement, the mechanical tolerances are not tigh enough or when the dimensions of the sleeve and the ferrule do not match. 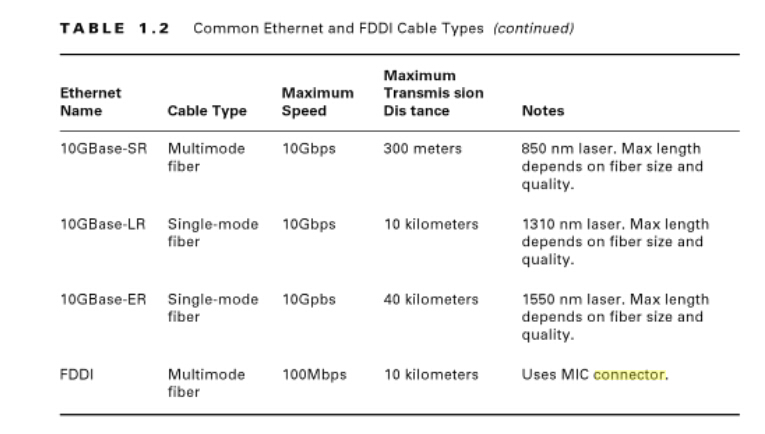 A fiber connector is characterized by several important parameters. As noted before, the most important factor is insertion loss, or simply connector loss. Another important factor is repeatability. If the same two fibers are connected through the same connector a number of times, each time the coupling will be slightly different. A good connector assmbly provides a small standard deviation for coupling efficiency across multiple insertions. Another desiralbe specification of a fiber connector is low return loss, i.e., a low back reflection. Return loss is defined as the ratio of the reflected power from the connector to the input power. For example, a return loss f 30 dB means 0.001 of the input power is reflected back from the connector. A conector must also be resistant and show a minimal coupling variation in the presence of normal mechanical forces such as axial and lateral forces. This is a practical requirement because in a normal environment it is likely for the connector to encounter a range of mechanical forces. A wide range of connectors have been designed and are in use in the industry. Here we give an overview of some of the most popular types. Straight tip or ST connectors are one of the more common type of connectors and in wide use in many applications. The ferrule diameter in an ST connector is 2.5 mm. ST connectors are spring loaded and enaged by a twist-and-lock mechanism. Fixed connector or FC connectors use an alignment key and a threaded (screw-on) socket and are similar to the popular SMA connectors used in electronics. They are in wide use in single-mode applications and provide low insertion loss and high repeatability. Subscriber connector, or SC, is another common type of connector. The advantage of SC connectors is that they are engaged by a push-and-snap mechanism, without the need for any roation. This make plugging and unplugging them very easy and also reduces wear out. Moreover, a higher connector density is achieved. Many transceivers provide either an SC receptacle connector, or a pigtail SC connector, as their optical interface. The push-and-snap feature of SC connectors thus provides very convenient and easy way of connecting to optical trasceivers. SC connectors are avaiable in simplex and duplex variations. The ferrule diameter in an SC connector is 2.5 mm. SC fiber optic patch cable is one of the earliest stype and one of the most commonly used fiber optic cable, it is convenient to use and cost saving, SC fiber optic patch cord is widely uesed in fiber optic networks. SC fiber patch cable is with zirconia sleeve and plastic housing. The common type of SC connector patch cord, there are SC to SC fiber patch cord, SC to LC Fiber Optic Patch Cable, SC to ST Fiber Optic Patch Cable, SC to FC Fiber Optic Patch Cable, ect. The LC or small form factor connector is similar to the SC, but with half the size. The diameter of the ferrule in an LC connector is 1.25 mm, vs 2.5 mm for most other connectors. This allow for twice the connector density for a given space. Because of their compactness, LC connectors have become more popular and are used in many high-end transceivers such as SFPs and XFPs. 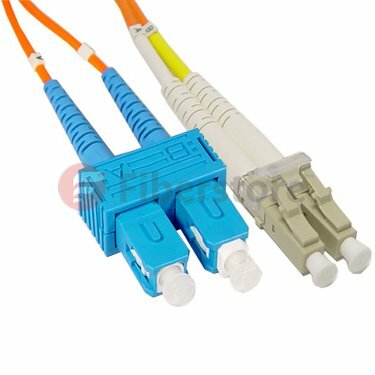 LC fiber optic patch cable is with a small form factor (SFF) connector and is ideal for high density applications. LC fiber optic patch cord connector has a zirconia ceramic ferrule measuring 1.25mm O.D. with a PC or APC endface, and provides optimum insertion and return loss. This entry was posted in Bulk Fiber Cables and tagged fiber optic connector, fiber patch cord, LC connector, sc connector on December 23, 2014 by Amelia.Liu. Data centers are the central location for data interchange and are found in enterprises, government offices, schools, universities, hospitals, and other networked server farms. 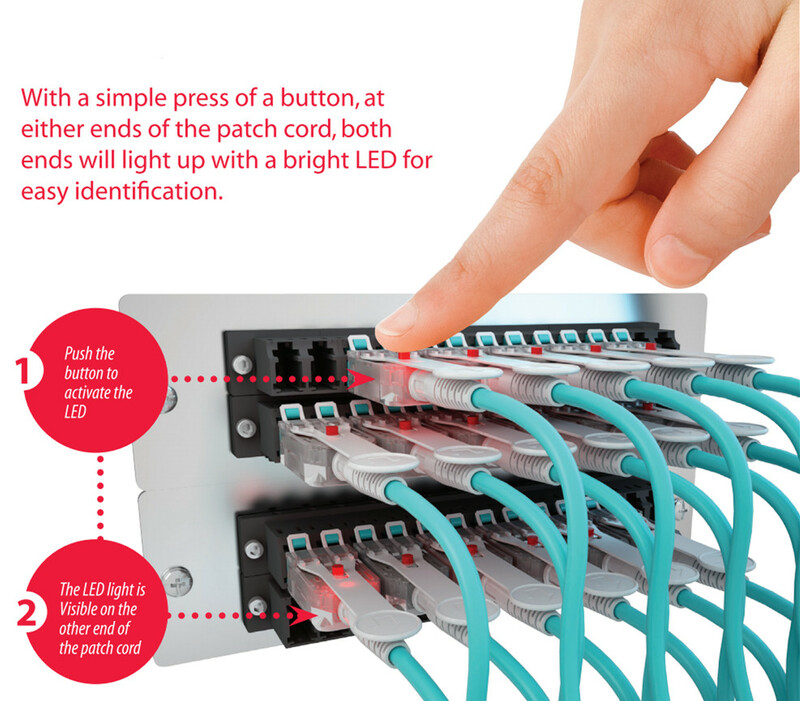 The ease of turning nearly any location into an information interchange hub has been enabled by the development of array-based fiber optic cabling systems. Ribbon fiber cables, array-based fiber connectors, and packaged breakout assemblies like fiber optic cassette provides modular small form factor connectivity and enable fast, reliable interconnection of fiber optic links in high-density data center environments. Once the decision has been made to deploy array-based fiber connectivity, care must be taken to ensure the integrity of connections between the transmitting optical light source and the receiving photo detector. The matching of the transmit signal (Tx) to the receive equipment (Rx) at both ends of the fiber optic link is referred to as polarity. The objective of polarity is simple: provide transmit-to-receive connections across the entire fiber optic system in a consistent, standards-based manner. Preterminated fiber MTP MPO optical cassettes and loose-tube or ribbon fiber backbone cables are the heart of a modular fiber system. The cassettes and cables typically support groups of full-duplex fiber connections. The challenge for the network system designer becomes one of assuring the proper polarity of these array connections from end to end. This white paper describes the methods defined in the ratified TIA/EIA (Telecommunications Industry Association/Electronic Industries Association) standard to assure correct polarity using MPO multi-fiber array connectors, cables and cassettes. Currently, a new release of the TIA-568 Commercial Building Cabling Standard is under development as the TIA-568-C series of standards. The fiber-systems section of this series will be TIA-568-C.1, and will include information on array system polarity along with a description of MPO array cables, duplex patch cords, and array transitions. Modular fiber optic cassettes-enclosed units containing 12- or 24-fiber factory-terminated fanouts-serve to transition small-diameter ribbon cables terminated with an MPO connector to the more-common LC or SC interfaces used on the transceiver terminal equipment. The fanouts typically incorporate SC, LC, ST-style or MT-RJ connectors plugged into adapters on the cassette’s front, and an MPO connector plugged into an MPO adapter on the cassette’s rear side. ectors at either end of the array cables that plug into the cassettes. 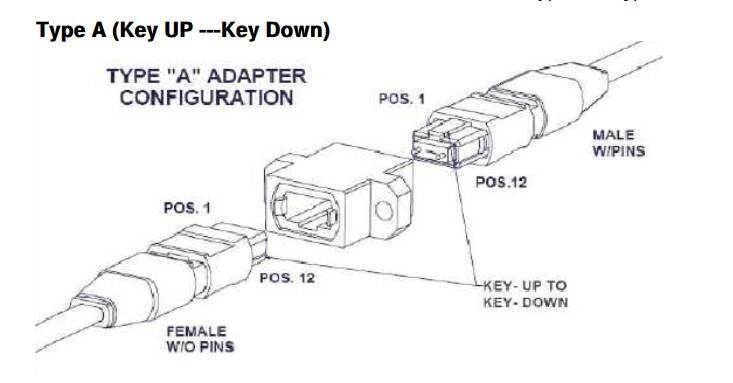 The transition that takes place inside a fiber optic cassette, the connector keying for the cassette and the corresponding MPO array cables are all thoroughly defined for all three connectivity methods listed in the TIA standard. A common transition, factory-installed inside a cassette, is used for all three methods. The adapter mounted at the rear of a cassette defines it as either a Method A or Method B type. The only difference between the two cassette types is the orientation of the internal MPO connector with respect to the mating MPO array cable connector. Method A cassettes make a “key up”-to-“key down” connection between the internal MPO connector and the MPO array cable connector. Method B cassettes make a “key up”-to-“key up” connection. It is important to note that a Method B cassette will not allow single mode angle-polish mated-pair connection because the angles of the mating connectors are not complementary. This prevents a Method B cassette or adapter from being used in single mode applications that require low return losses-a significant limitation. Modular fiber optic cassettes are connected to one another with MPO to MPO ribbon backbone cables. The connectors on these cables do not contain alignment pins, but they do have mating alignment holes. Alignment pins are factory-installed in the MPO fanout connectors installed inside the fiber optic cassette. The TIA standard defines three different 12-fiber MPO cable: Types A, B, and C. Each is used for its respective connectivity method (Methods A, B, and C). For the Type, A array cable, the opposing connections at each end of the cable have the same fiber positions, except that one end has the key oriented facing up while the other end has the key oriented facing down. The Type B array cable has opposing connectors with both keys oriented facing up, but the fiber positions are reversed at each end; the fiber at position 1 at one end is connected to position 12 in the connector at the opposing end. In the Type C array cable, the key is facing up at one end and facing down at the other end. It looks like a Type-A array cable, but the Type-C cable is designed such that adjacent pairs of fibers are crossed from one end to the other. In this case, the fiber at position 1 on one end of the cable is shifted to position 2 at the other end of the cable. The fiber at position 2 on one end is shifted to position 1 at the opposite end, and so on. The fiber patch cord, cassette (transition) and array cable previously described are used in specific combinations to form end-to-end full-duplex fiber links. Each component of the total fiber cabling system is unique, underscoring the importance of assuring that the correct component is selected and used in the proper sequence. Importantly, regardless of which method defined in the TIA standard you use, there must be a pair-wise flipping (A-to-B polarity swap) that takes place at some point in the link. If the pair-wise flipping does not occur in the cassette (transition), then the pair-wise flipping must occur in the duplex patch cord, or in the MPO-to-MPO array cables and/or adapters. Modular fiber optic cassette-based cabling technology offers many advantages facilitating high-performance, rapid, and error-free installation, as well as reliable, robust operation. The best way to maintain correct optical polarity in these systems is to select a standards-based approach and to adhere to it throughout an installation. The three connectivity methods defined in the TIA/EIA-56-B.1-7 standard present the guidelines for maintaining polarity using array connections. It is in the best interest of the installer and end-user to select modular fiber optic cassette-based solutions that adhere to TIA standards. Proprietary non-standards-based solutions will not assure interoperability. In addition, those solutions may not be compatible with commercially based components designed to meet the TIA standards. Selecting modular fiber systems that comply with TIA standards can help to prevent costly troubleshooting and rework of the installed fiber cable plant. Additionally, fiber-network installers can be assured of a readily available product supply from multiple stocking supply sources with acceptable delivery lead times. This entry was posted in MPO/MTP solutions and tagged fiber optic cassette, fiber patch cord, MPO cable on July 28, 2014 by Amelia.Liu. Optical fiber communication refers to modulate voice, video and data signals to the fiber patch cord as a communication transmission medium. The optical fiber can be divided into multimode fiber and single mode fiber. The central glass core of single mode fiber is fine (core diameter is usually 9 or 10μm), it only can transfer one mode light. The mode dispersion is small, and it is for remote communication, but it plays a major role in the chromatic dispersion so that the spectral width of the single mode fiber has a higher light stability and the requirement that the spectral width is narrower and better stability. 1000 Mb/s fiber optic transmission distance is 550m-100km. As we all know, we commonly see 9/125μm single mode optical fiber in the market. 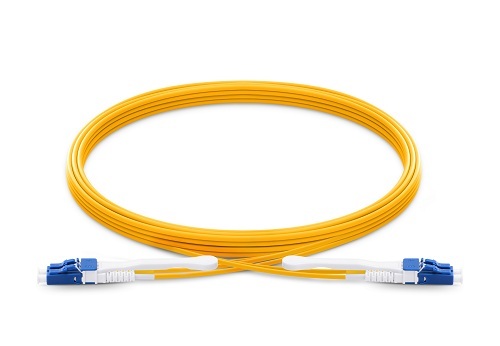 And single mode 9/125um fiber optic patch cables are recommended for Fast, Gigabit, 10G Ethernet or SONET OC3-OC192 rate optical connections. Low prices make the 9/125um fiber attractive for in-building projects too, because of the reliability and choice of using a single-strand of fiber for same communications (simplex cords are used on Bi-Directional data links). The central glass core of Multimode fiber is coarse (50 or 62.5μm), multiple modes of light can pass. However, its mode dispersion is among large, which limits the frequency of the transmitted digital signal, and with the increase in distance will be more severe. Multi-mode fiber transmission distance is relatively recent, generally only a few kilometers. 1000 Mb/s fiber optic transmission distance is 220m-550m. In general, we can find 62.5/125um Multi-mode fiber optic cable in the market. 62.5/125um multimode fiber cables are recommended for Fast Ethernet and up to OC3/STM1 rate optical connections. They can also be used for Gigabit Ethernet multi-mode connections on distances less than 275 meters. 62.5/125um fiber is most used inside buildings. In the network wiring, the more applications optic fiber has three types, there are 62.5μm/125μm multimode fiber, 50μm/125μm multimode fiber, and 9μm/125μm single mode fiber. According to the rate and transmission distance, we can distinguish and choose single/multimode optic fiber. Tied the fiber bundle, outside has the protective housing, which is called fiber cable. According to different application environments, the cable can be divided into indoor and outdoor fiber optic cable. Fiber refers that the fiber jumper with a desktop computer or device connected directly to facilitate the connection and manage the device. 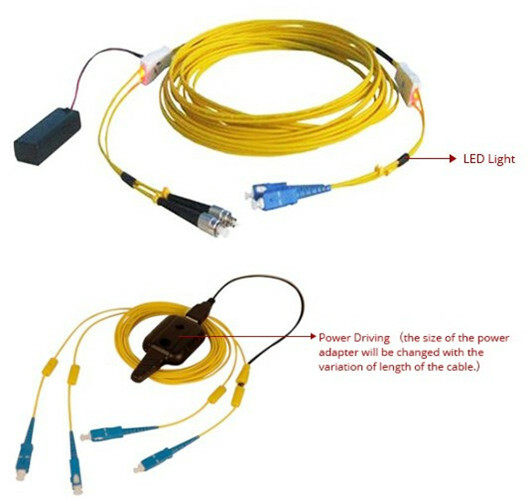 Fiber jumpers are also divided into two multimode and single-mode, which are connected with single mode and multimode fiber. Jumper for an active connection cable between the two devices without connectors (as distinguished: patch (patch cord) is one or both ends with connectors; jumper is at both ends of the cable has a fiber optic connectors, the device can be directly connected, but only one end of the fiber pigtail connector and the other end to the fiber splicing). 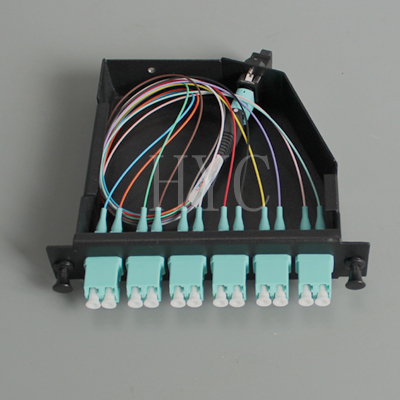 Fiber patch cord connector shape can be divided into FC, SC, ST, LC, etc. According TO ferrule grinding mode, it can be divided into PC (plane), UPC (spherical surface), APC (8 degrees inclined plane ) and other (cable optical transceiver general requirements FC / APC connector). According to the type of optical fiber, it can be divided into the single mode optical fiber, 50/125 multimode, 62.5/125 multimode and Gigabit, etc. According to the optical fiber connetor, we commonly see LC, SC fiber patch cord in the market, the following products are LC-SC fiber in our online store, if you have interest, you can go to our store to have a see. 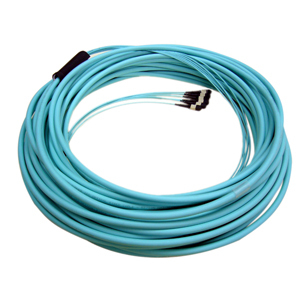 Fiber patch cord products are widely applied, it applies in the communications room, fiber to the home, local area networks, fiber optic sensors, fiber optic communication systems, fiber optic transmission equipment connected, defense readiness and so on. Apply to cable television, telecommunications networks, computer networks and optical fiber test equipment. Broken down mainly used in several ways. This entry was posted in Bulk Fiber Cables, Single Mode Fiber (SMF) and tagged fiber patch cord, Multimode Fiber, singlemode fiber on June 16, 2014 by Amelia.Liu.